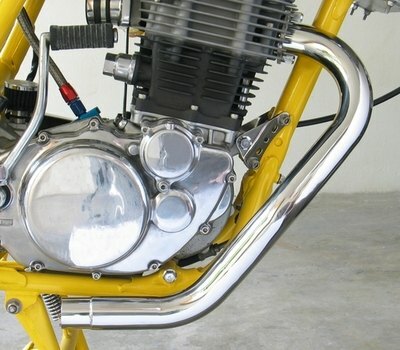 Polished swept back stainless header pipe to fit the fuel injected SR500 & SR400. This is a high quality polished stainless steel swept back header pipe. It includes a threaded fitting for mounting the oxygen sensor. The swept back and tucked in profile of this header pipe is reminiscent of the classic British racers from years gone by. This single wall stainless pipe weighs just 1065 grams, offering a significant weight savings over the original pipe. Included is a heavy gauge stainless mounting flange. Outlet outside diameter is 41mm. May be used with the original silencer or an after-market unit. Suitable for all fuel injected Yamaha SR500 and SR400 models. 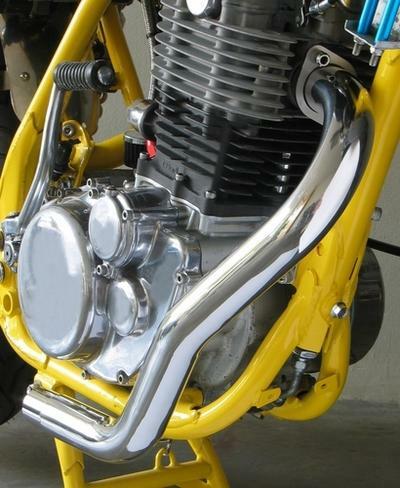 These will make an attractive addition to your cafe racer or custom project.